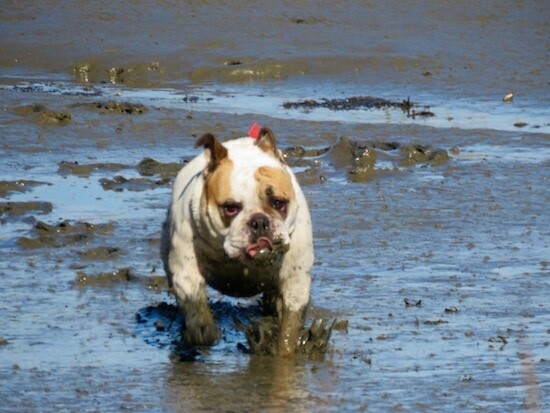 Chicklet the English Bulldog at 1 year and 10 months old playing in the mud!—"A friend and I went down to The beach here on the Island and The Chick did boom boom boom in the MUD = OMG. Had to quarantine her in car going home (lol) and she went from car straight into a tub for scrub-a-dub-dubbed!!! My girlfriend and I were totally screaming with laughter beyond control. She was and had such a good time, but then again no matter what we do she always does!!! She's The Bestest Happiest Doggy Kid I've ever known. She constantly has FUN & loves Doggy Life." 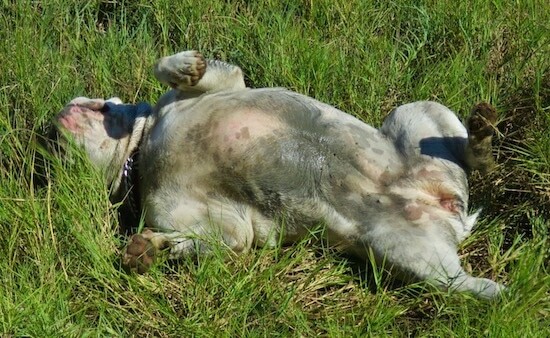 Chicklet the English Bulldog at 1 year and 10 months old rolling in the grass after playing in the mud. 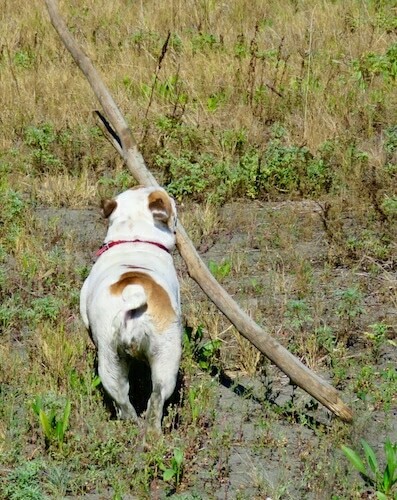 Chicklet the English Bulldog at 1 year and 10 months old playing with a huge stick. 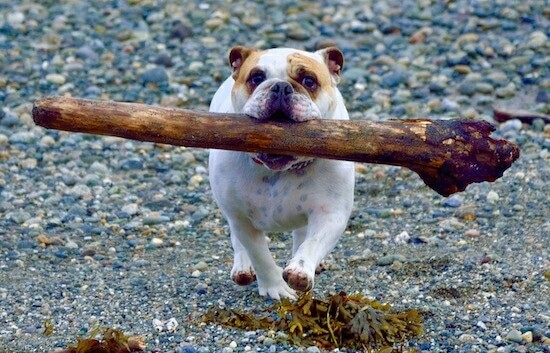 Chicklet the English Bulldog at 1 year and 7 months old running with a big log!—"Look at the size of this log she picked up on the Beach!!! Running around with it like it was a stick, ha ha ha. Only 1 year and 7 mos old and she has remained small. But, she's a play monster beast. She's the best!!! One of the happiest dogs we've ever met. Constantly happy, always playing until she drops and her little tail vibrates from happiness all day long!!! " 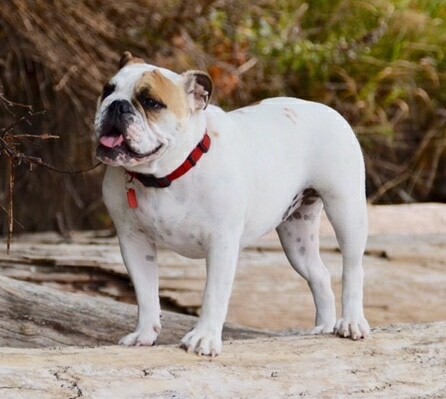 Chicklet the English Bulldog at 1 1/2 years old "That is a driftwood log that Chicklet is standing on. She picked it up in her mouth with ease and was running around with it. LOL She is totally the KID of our dreams. We adore her!!!" 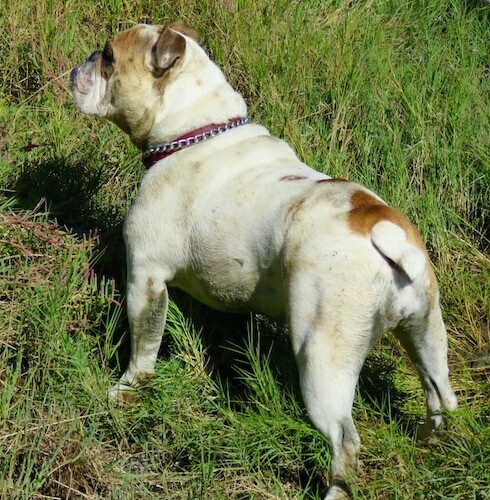 "Chicklet the English Bulldog on her birthday at 1 year old weighing 43 pounds. She is really, really good, well behaved and a total love bug!!! We couldn't have asked for a better Bully Kid sooooo. 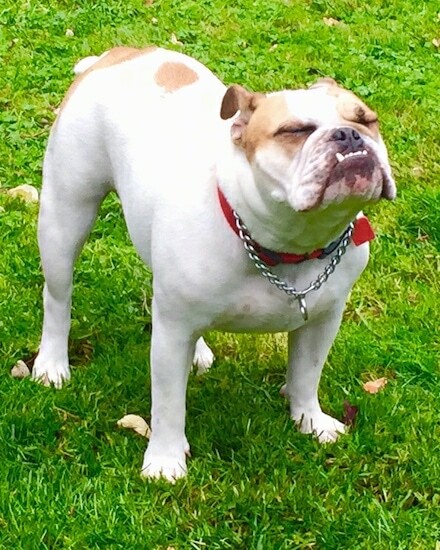 We are in Bully heaven!!" 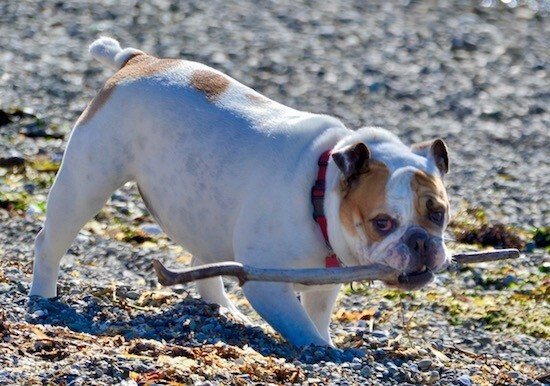 "Chicklet the English Bulldog at 9 months old weighing 40 pounds having fun at the beach playing on the driftwood. 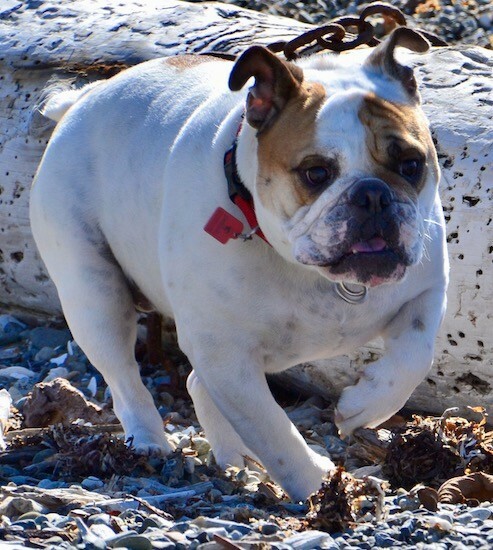 She definitely has the tenacity of an English Bulldog!" 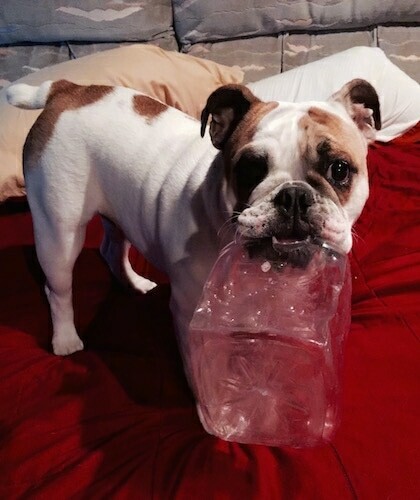 Chicklet the English Bulldog puppy at 8 months old weighing 35 pounds—"One of her favorite toys is a plastic jar. She's a beast. She mutilates and destroys expensive toys from the pet shop in a few days. This plastic jar has lasted almost 2 weeks already...lol We are saving some money!" 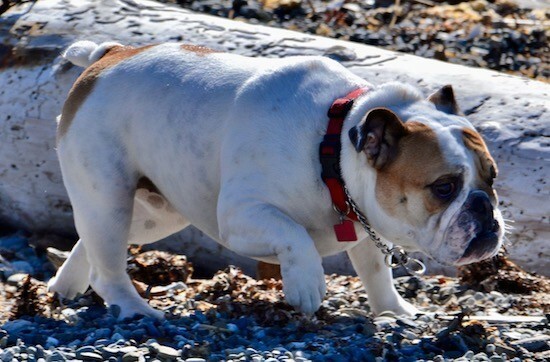 Chicklet the English Bulldog puppy at 6 1/2 months old weighing 30 pounds—"She's awesome!!! We adore her. She's a goof ball (no pun intended)... and of course spoiled rotten." 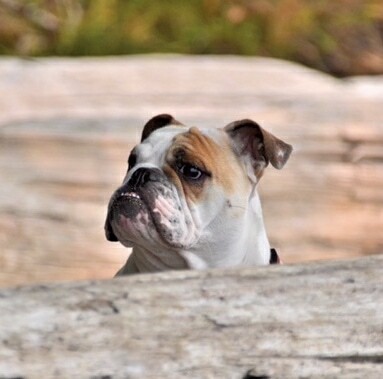 Chicklet the English Bulldog puppy at 19 weeks old out on a hike with her owners—"I love to go on hikes with mom and dad and they say I am a real trooper. This was a 4 mile hike for me, woof woof." 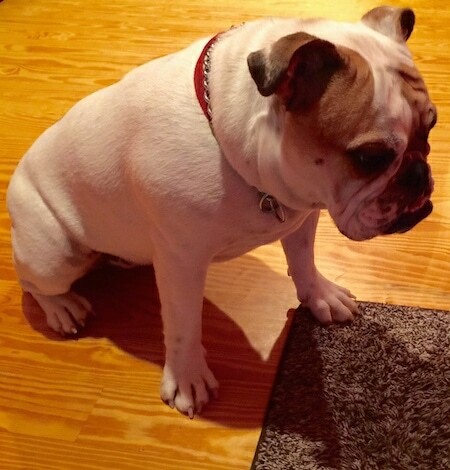 This is a video of Chicklet the English Bulldog puppy at 18 weeks old chasing a Wobble Wag Giggle Ball through the house with a GoPro camera strapped to her back. 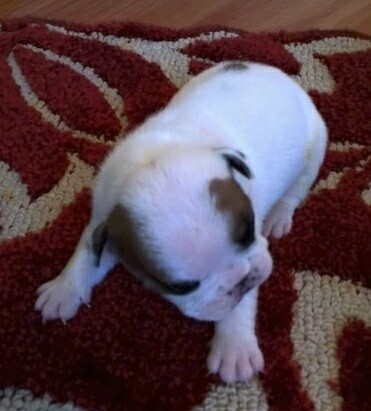 "Chicklet the English Bulldog puppy at 8 weeks old the first day in her new home. 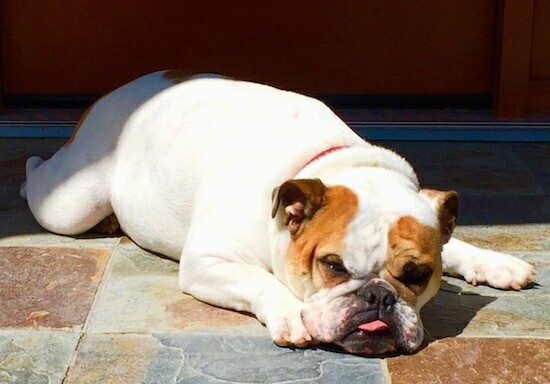 She is AdoraBULL and brilliant." Chicklet the English Bulldog puppy at 8 weeks old the first day in her new home—"This is Chicklet in our entry way. 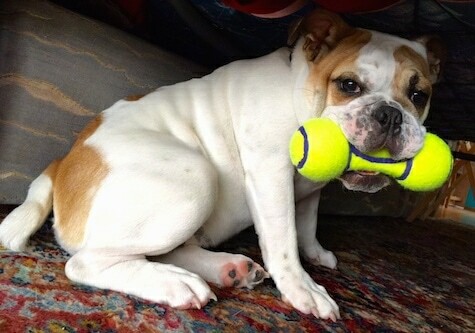 Bullies like to hide and go under things for shelter. Here she was trying to hide but did not succeed as I found her... lol"
Chicklet the English Bulldog puppy at 8 weeks old scoping out her new home. 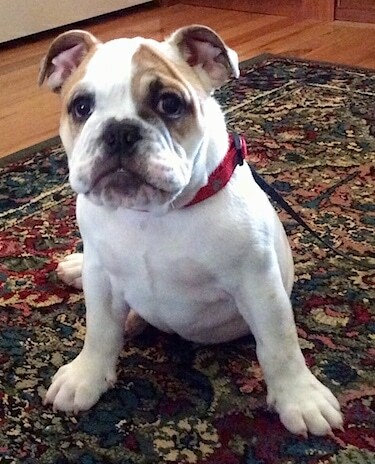 Chicklet the English Bulldog puppy at 8 weeks old—"She loves to sit on our laps, chest and everywhere possible. She's a trip because she will lay on our heads, necks (very cat like). She's already goofy and silly. We lucked out." 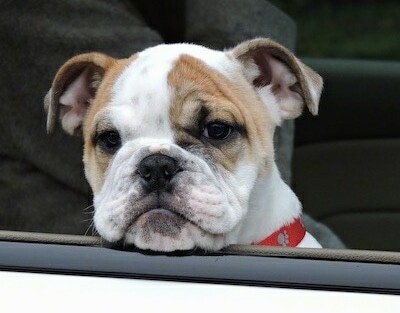 Chicklet the English Bulldog puppy at 8 weeks old—"This was when we first brought her home. It was a long 3 hour drive and she was awesome."